Happy Friday. Your first Bearmageddon Friday. 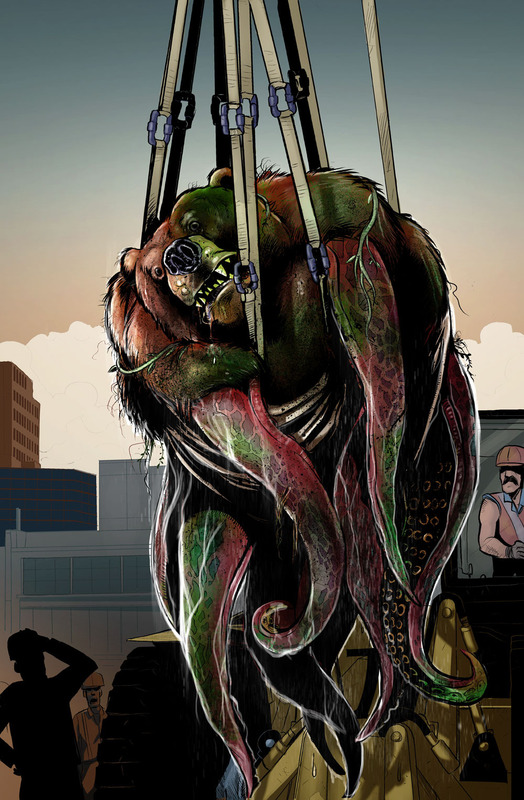 I leave you for the weekend with this image of a big disgusting octo bear that was just pulled out of a sewer. Noah did a great job coloring this but I obsessively went in and added even more muck and gunk because I really wanted that bear to look filthy. I hope that by now the site has propagated and everyone is able to see it in it’s true form, as it was intended by it’s creator to be seen. I apologize that “August 3rd” turned out to be a cruel lie for some of you. The site did not go up until the afternoon due to some problems on our side of things, then after it was finally posted it still took who knows how long to start showing up on people’s screens. A little time here, a lot of time there. I learned that doing a “hard launch” of a web site is not easy. I appreciate people sharing this comic with friends and coming here to comment. Also thanks to Doug over at Ratfist.com for sending his readers my way. I used to read his comments section with great envy… Ratfist fans are good people – right up there with Axe Cop readers. I hope you will stick around here. Bearmageddon, week one, is now behind us. Thanks for joining and I’ll see you on Wednesday! 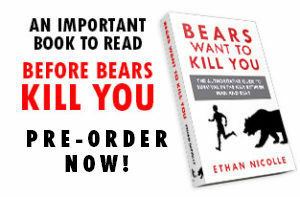 The bears are coming for you… « Random moosages as I see fit. My New Shirt and Other Stories « jeffylish! “Bearmageddon Friday”.. That must be a new international holiday.. This was supposed to post at 9am… I guess technically it did, just not in the right time zone. I’m learning! Also, I’m really hoping to see an elaborate cosplay of this thing. I’d like to think that they were there to clean out the pipes or something and just stumbled onto this octo-bear. If there is a cosplay of this, prepare to deal with wet dung, rotten tuna, and wet dog smell. As the writer I can confirm this is what happened. If there ever is Bearmaggedon merchandise, I’m hoping the octo-bear plush toys come with a scratch and sniff card so that we can all experience the smells of this universe. I’m thinking I’ll put a Bearmageddon section in the AC forum and link it. By the way, i was thinking of making you a mod if you would be interested. I like comment functionality on this site way more than on Axe Cop! Nice art again. Imagining the smell did help. He looks disgusting! Which is to say, of course, great job! Oh man I really want to make those now! I’m assuming you and TenNapel did not orchestrate the start of Bearmaggedon with the ending of Ratfist…either way, it works out great for readers needing a new daily read(like me). So far you start reminds me of a great Spielberg movie. Nope, total coincidence. It worked out well though it seems. I’ll be interested to see how Ratfisties will like Bearmageddon. That guy. You know the one. awww man. I wonder how many people are gonna die. It’s best to just thank God for the few who survive… If any. I love this coloring because if gives a sense of the unworldly. I’m not sure if this was intentional or if it was only meant as octopus arms covered in sewage. In any case, the pinks and purples with green highlights remind me of one of the original tentacle monsters in The Dunwich Horror. Thanks, I wanted this page to be unsettling… The picky side of me still feels like I could have done better but it works. I have been really looking forward to this. It sounded like The Walking Dead with bears (which is terrifying). Can’t tell you how happy I am to finally have this series materialize; been excited about the concept since the pre-Axe Cop days. Off to a great start! Also, 4-inch orange door hinge. Excellent stuff man. I wish you could update more often. Me too! I need to grow tentacles so I can get more done. awesome stuff… for simplicities sake, I would suggest just sharing a forum with your Axe Cop one, linking them both to their respective forums, and creating Subforums pertaining to each one… just a suggestion. I’m sure you’re all over this already… or not. Yeah I was thinking the same thing. I’ll work on that. I don’t think that bear is dead… It looks very much alive. This is great stuff, man. Looking forward to more. I want carnival dart game grand prize-size plushies! Me too! I’ll practice throwing darts in an arc (I heard that’s how you break the balloons) so I can win one when it comes about…that is after I visit the carnival freak show! Since many of us are seasoned Axe Cop and Ratfist buffs, and the title is absurd, I’d infer that most of us walked in expecting Bearmageddon to be ridiculous. This page is an excellent kind of dramatic irony between the Ethan and the readers… I’m wondering what the balance is going to be between hilarious and the horrifying. yeah this comic is definitley going to be absurd, but it is not as self-aware as Ratfist or even Axe Cop. It is much more in the realm of something like Shaun of the Dead that is really a buddy comedy against the backdrop of a zombie apocalypse. Wish me luck! The comic looks amazing so far! More thanks to Doug for linking this page. I love to get in right at the beginning. Hmm… Noticing what seems to be a little robot thing near the far let tentacles. sorry that’s just part of the tractor type thing. You can dream though. I have to really say I am enjoying this. The concept of mutated bears running amok sounds fun and a bit scary. I would hate to see (or smell) this octo-bear in real life. Also, what could kill and munch on this critter? yeah that’s what I love about drawing this thing, it fascinated and terrifies me. Ethan, there is an app for the Android called DailyComix that lets you read web comics on your phone. Maybe you could get Bearmageddon and Axe Cop on there. I would like to do an app at some point… just another thing I need to look into. Good luck Ethan. I’m looking forward to where this one takes us. That’s disgusting. My god. Putrid and horrible. Great work! So glad the site finally sorted itself out so I can read the comic. Octobear just kinda rolls off the tongue! and i would totes buy and plush octobear!!!! I made my wife jump when the page populated and I shouted “GAWD!” …love this. Nothing against your wife, I just hope this happens many more times as the story progresses. I’m really digging this Ethan! Since Ratfist just finished I’m glad I have another web-comic to start following again. 🙂 This has such amazing artwork compared to axe-cop, keep up the good work! I didn’t even realize the release date I chose for this comic was a day before Ratfist ended. Best unintentional choice I have made in a long time. Sweet Jesus this is going to be awesome! I’ve been reading axe cop for a while and I am very excited to see what comes of this new series, looks exciting. I hope that we get to see the extent of your artistic genius used here. Everything you’ve done on Axe cop has been nothing short of inspiring for me, a fellow artist, and Bearmageddon looks like it will be nothing short of amazing. I’m still waiting until Colbert reports on this new bear threat. It will be another branch out for me artistically for sure. Thanks so much. I draw all this stuff for a number of reasons, but knowing it inspires other people is one of the more rewarding reasons. ohhhh yeah! Everything about these first two pages already screams bearma-awesomeness. Totally inspiring and I’m already chomping at the bit for the next ep! keep up the awesome work dude(s)! I shall name him Urthulu.